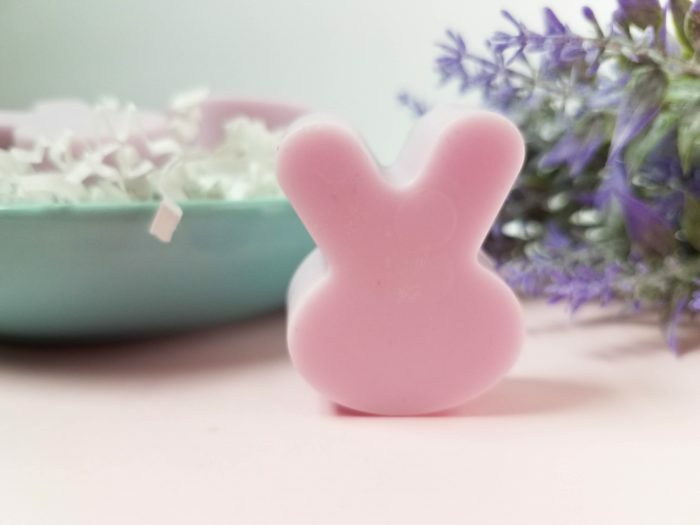 Enjoy the calming scent of lavender essential oil with these adorable homemade bunny soaps. 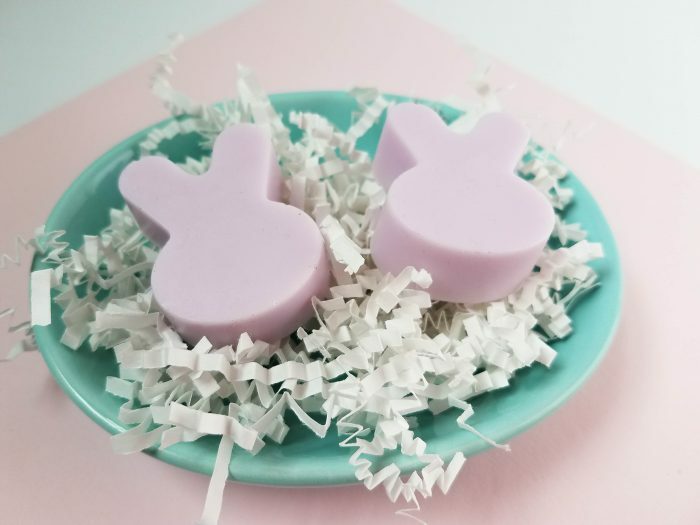 The kids will love seeing these simple homemade bunny soaps in their Easter baskets this year as a non-candy Easter basket filler, or you could use them as a more natural scent option throughout your house. In all honesty, these make an adorable addition to any bathroom too. The lavender scent holds strong to keep as a decorative dish on the back of your toilet or a shelf in the bathroom to continuously enjoy a nice smelling bathroom. 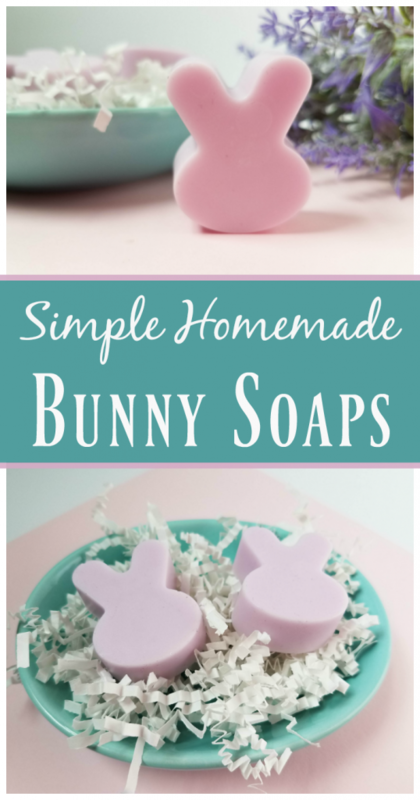 The list of ideas I have to use these homemade bunny soaps could go on and on, but for today I’ll focus on some facts about homemade soap and why you should really try your hand at these easy homemade bunny soaps. What are the ingredients for homemade soap? The ingredients for my homemade bunny soap include Shea Butter Melt & Pour Soap Base, Lavender Soap Colorant,? and Lavender Essential Oil. This is a pretty easy beginner homemade soap recipe that will leave you wanting to make more homemade soap. 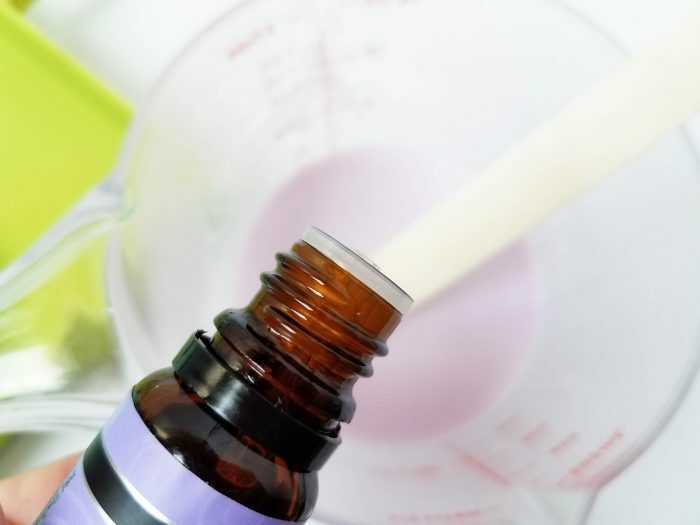 There are other homemade soap ingredient options if you’re looking to make other soaps. I have a couple of homemade soap recipes on my site such as Coconut Rose Petal Soap and Strawberry Scented Heart Shaped Soap.? Which Oil is Best for Soap Making? As you can see I enjoy using Essential oil and a melt & pour soap base option, but some homemade soaps are made using different kinds of oils. The best oils for soap making include, but are not limited to; Coconut Oil, Avocado Oil, and Cocoa Butter. Each oil for homemade soap has a different purpose, such as conditioning or moisturizing as well as adding hardness to your homemade soap. 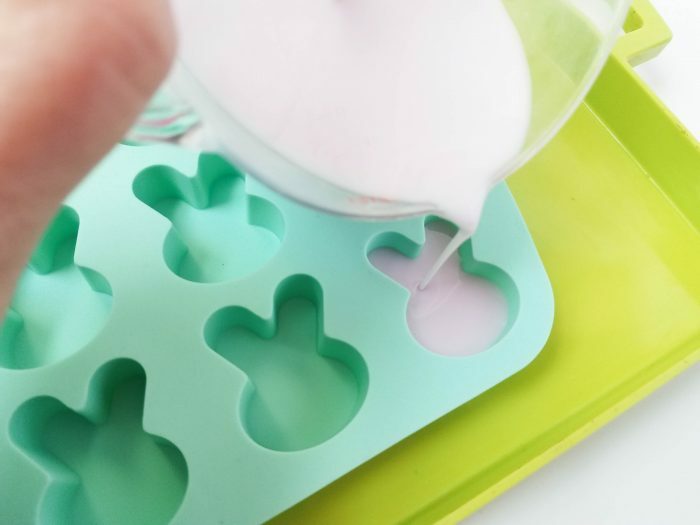 I like to use easier homemade soap options so that anyone can enjoy making these simple homemade bunny soaps. What is the base for soap? Melt & pour soap base is what I prefer to use when making homemade soap. 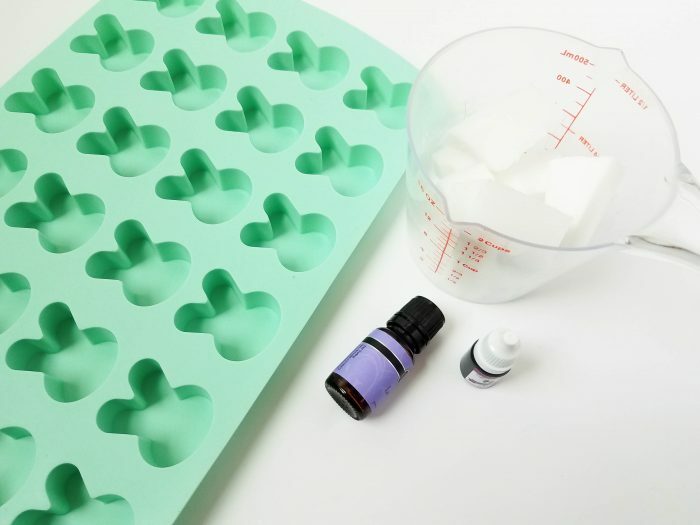 This base for soap comes all ready for you to use as a soap base for your homemade soap creation. Melt and pour soap can be used immediately and usually contains all you need except the fragrance you desire. Melt & pour base for soap is often a great option for moisturizing homemade soap, as it’s usually made with shea butter or argan oil. 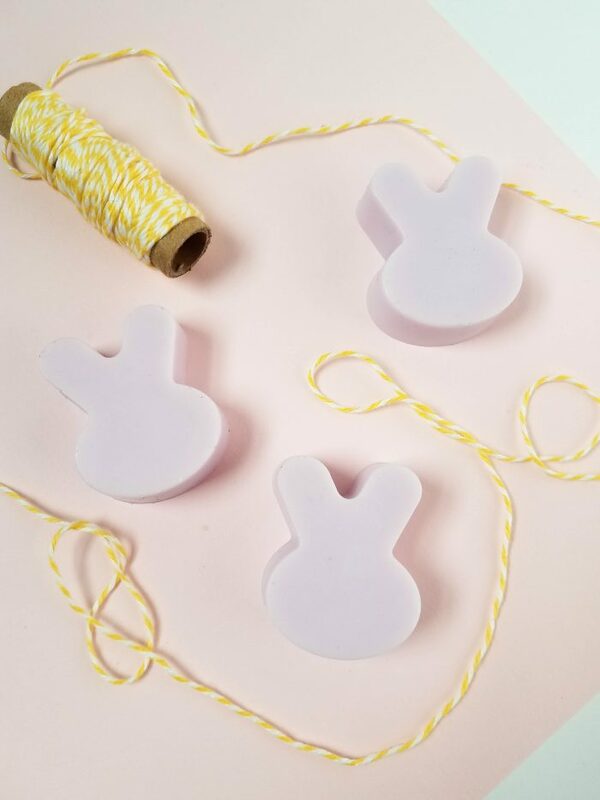 This simple homemade bunny soaps recipe is a fantastic way to get your feet wet in the homemade soap making arena. 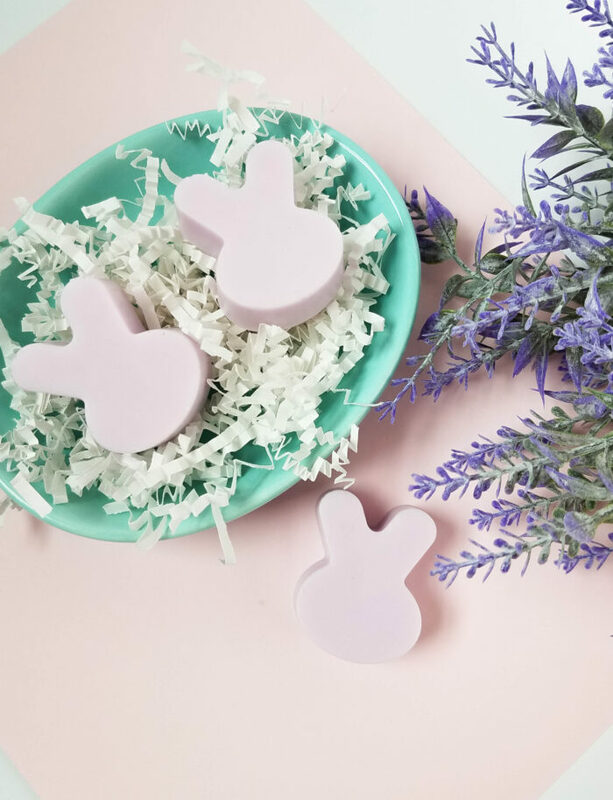 Enjoy the light scent of lavender before, during and after you’ve completed making these adorable bunny soaps. *This post contains affiliate links. This recipe will fill 16 of the bunny cavities. Melt the soap in the microwave for 30 seconds. If not fully melted, put on for 10 second intervals until completely melted. Add the soap colorant and essential oil. Stir well. Let stand for about 2 hours, then remove from mold. There you have it, an easy DIY soap project for Easter! Those are so adorable! I would love to make some of these with my daughters. We’ve never made soap before, so this would be so much fun.